Since the news about the UAE planning to build a 2000-km-long rail network up to Mumbai in India broke out, Indians have held on to their breaths for oodles of adventure that the London to Paris undersea high-speed train travel offers currently. 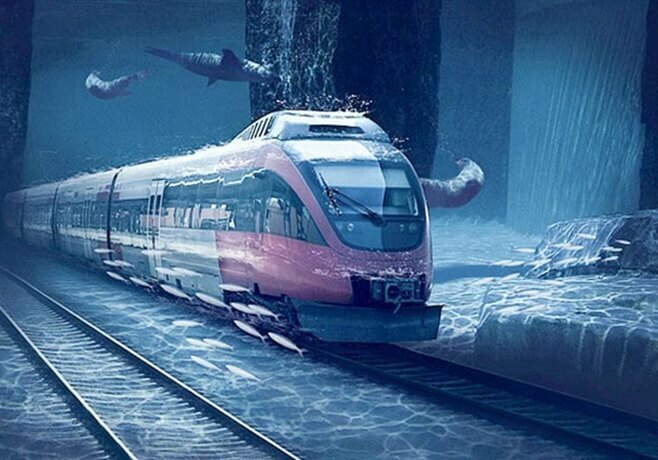 The proposed underwater ‘floating rail’ track will make high-speed train travel between Fujairah City and Mumbai a reality, much to the surprise of the world. Proposed at the recently held UAE-India conclave in Abu Dhabi, the Fujairah-Mumbai underwater, high-speed floating train travel project is expected to boost bilateral trade between the two countries. Currently an abstract concept, the underwater rail from Fujairah to Mumbai is sort of a give-and-take policy which will facilitate export and import between India and the UAE. India will export excess freshwater from the Narmada River, the lifeline of Gujarat and Madhya Pradesh, to the UAE. In exchange, the UAE will export fossil oil to India from the Fujairah Port. If things fall in place as planned, it will pave the way further for bilateral trade between the UAE and India. The Fujairah-Mumbai underwater rail project holds some good for Indians in the United States too. Not only Indians in the UAE but also Indian Americans will be able to breathe in the thrills of riding ultra-speed, floating trains to Mumbai from Fujairah after landing in Dubai or Abu Dhabi. Fujairah city is a one-hour drive from Dubai, while it takes 2 hours 30 minutes from Abu Dhabi. Both Dubai and Abu Dhabi have very good air connectivity with several major US cities. Other than operating nonstop flights from Newark (EWR) to Dubai, which provides one-stop access to nine Indian cities, Emirate Airlines operates from Boston, Chicago, Dallas, Houston, Los Angeles, New York, San Francisco, Orlando, Seattle, Washington DC, and Fort Lauderdale. In March 2018, Emirates started operating daily nonstop flights from Orlando (MCO) and Fort Lauderdale (FLL) to Dubai, with one-stop access to its nine destinations in India. Instead of taking connecting flights to Mumbai or any other Indian city from Dubai, Indians from the above-mentioned US cities may choose to board the undersea, high-speed trains to Mumbai from Fujairah following their arrival in Dubai. With the proposed train travel in their USA to India itineraries, Indians in America will have an unforgettable experience. Since Indian passport holders with a valid US visa or a green card (for lawful permanent residency in the US) are eligible for the 14-day visa on arrival at any point of entry in the UAE, they can make the most of the proposed Fujairah-Mumbai underwater rail for high-speed train travel after having a vacation in Dubai or Abu Dhabi. China and Japan are home to Maglev or floating trains that use magnetic repulsion to be running at a break-neck speed. Also, the United States and Australia are said to have plans for the same or similar underwater, high-speed train travel. The Mumbai-Ahmedabad Bullet train, which is expected to have its maiden journey in 2022, will run under water for a short distance en route. The feasibility of the UAE-Mumbai underwater rail project will be examined before India or the UAE government reveals further information about the project. Travel Beats, a subsidiary of Indian Eagle Travel, is a leading Indian American community portal catering latest visa, immigration, passport, aviation and community news. A most trusted travel booking partner of Indians in USA, Indian Eagle has a proven track record in booking cheap flights tickets to India for economy, business and last-minute air travel.